What are wings without some ranch dressing dip and with this homemade ranch dip you’ve got a real winner. The dip is creamy, and flavorful and the perfect thing to cool down some spicy hot wings. It’s almost the end of football season, and that means the big game is going to be here in just a couple of weeks. The best part about watching the big game or any football game is the delicious food! I like to pile a table full of the perfect munchable appetizers, side dishes and desserts. That means a table of hot wings, chips, dips, cookies and more. These delicious wings are precooked, which means all you have to do is grab them and go – perfect for a meal anytime, but especially when you’re watching football. 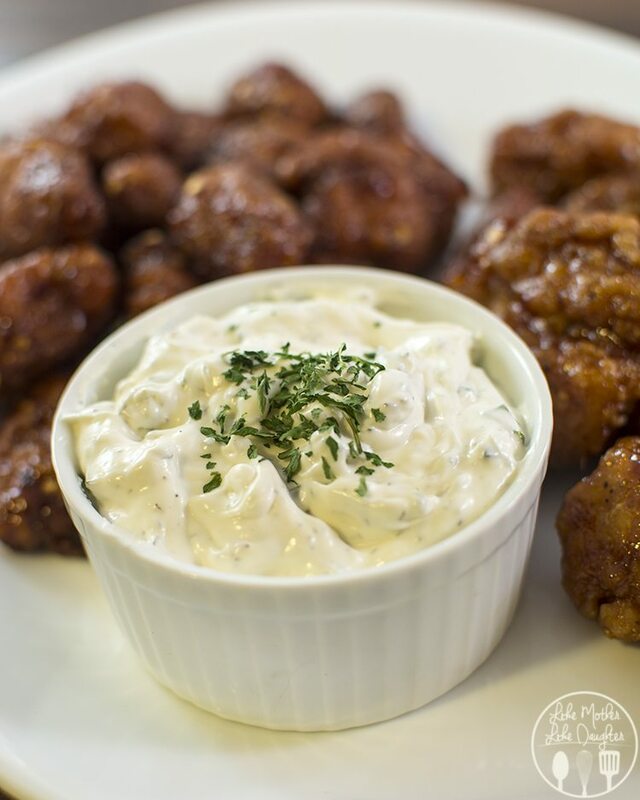 Dip your delicious wings in some homemade ranch dressing dip and you’ve got a real winner. This dip is creamy, and flavorful and the perfect thing to cool down some spicy hot wings. Ps. It also works great for a chip dip too. This creamy ranch dip is simple to make with ingredients you’ll most likely have on hand already – so you can just whip it up before you grab your wings and chips and are ready to watch the big game. What are wings without some ranch dressing dip and with this homemade ranch dip you've got a real winner. The dip is creamy, and flavorful and the perfect thing to cool down some spicy hot wings. Put all your ingredients in a medium sized bowl. Stir everything together till smooth. Place in refridgerator for 30 minutes (or longer) to chill before serving. Enjoy this delicious creamy ranch dip as part of your spread for watching the big game! Your recipe was so easy to make and delicious! Everyone devoured it immediately! It’s so better than the ranch packet dips with all the chemicals! Thank you so much you made our Super Bowl party!! Yay I’m so glad you liked it! It’s definitely one of my favorites! We love ranch dip and this homemade versions sounds totally amazing! I love how easy it is to whip up too!